A stunning exploration of naked vulnerability and self discovery. 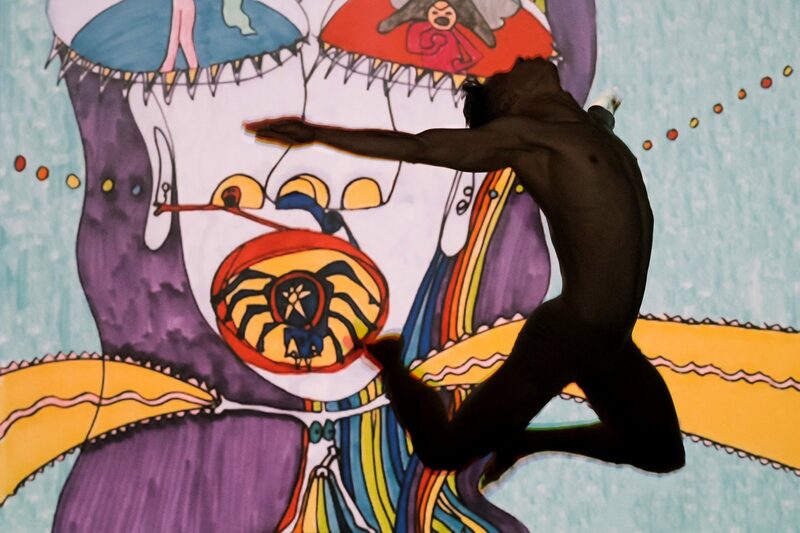 Indivisible is an interactive performance that arises from a stylized animated world, contemporary dance and spoken word text. The concept by Nadia Chaney expresses the theme of inherent relationship between opposites. The visuals she created from a long series of automatic drawings are a dreamlike story of a quest for transformation and intimacy in seven short acts. The neo-traditional electronic soundscape composed by Rup Sidhu elevates the athletic duet choreographed by Julio Hong. 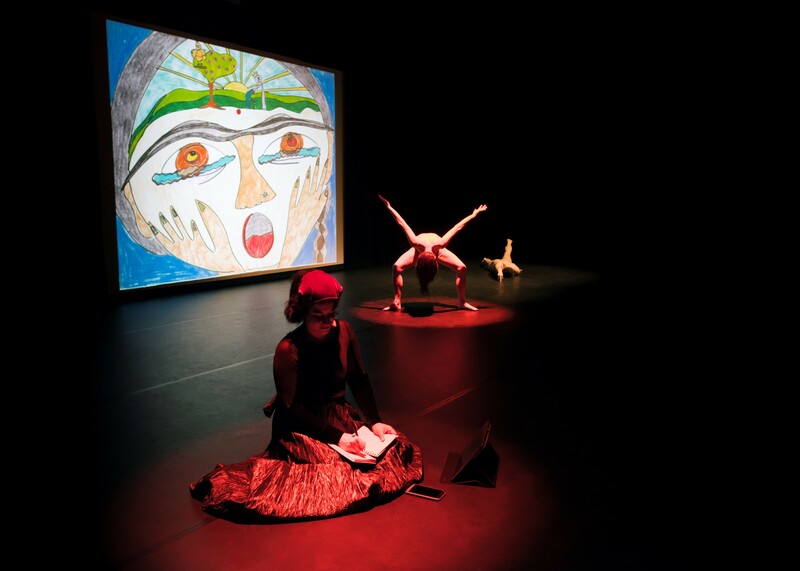 Together they aim to spark the imaginations of the audience to write/text their impressions during the performance, while Nadia in real time composes lyrical spoken word poetry from the reflections. Indivisible is a surreal, sublime and intimate journey that makes transparent that it may often seem that our world or ourselves are composed of irreconcilable opposites; we are broken, torn and alienated from eachother. Instead Indivisible is a testament that we are never apart, never alone, and even our most private dreams matter. 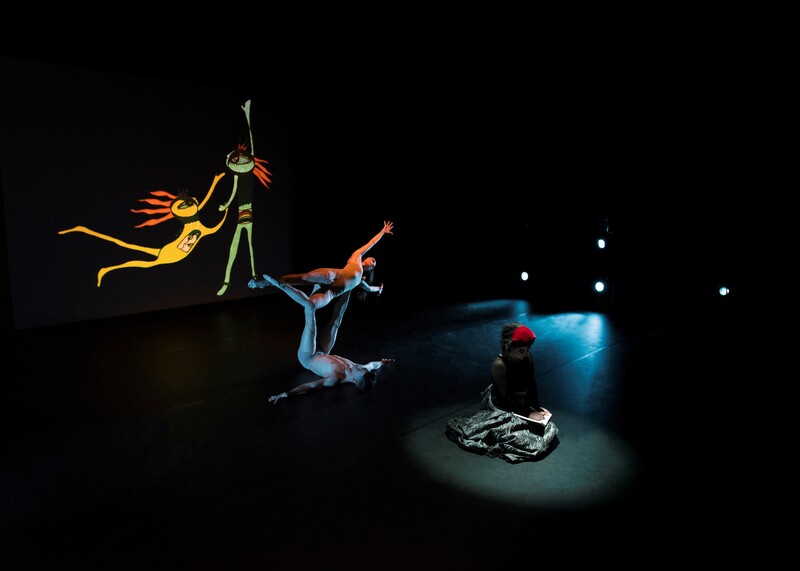 Technical requirements – Video projection, dance marley. Nadia Chaney is an award-winning spoken word poet as well as a community arts facilitator, published poet, musician, creative non-fictionist and an emerging visual artist. Because of her multi-disciplinary interests in the arts some of her favorite projects have included: A drum-and-bass sculptural slide show and community forum on Commercial Drive in Vancouver called the Psi Co Sly Show (2001); a dance-music-poetry-story collaboration to depict Mohawk writer Pauline Johnson’s version of the story of the Two Sister mountains on Vancouver’s North Shore for the Sistahood Festival (2006); a music-dance-projection-theatre production called Myrtle Silverspot also for Sistahood (2009); and a painting-music-poetry-science installation A440Hz Electromagnetic Explorations for the Vancouver New Forms Festival (2007). Her latest multi-disciplinary collaboration Illuminator was in Seattle in Dec 2016, as part of the Stay Happy Collective Series. Chaney’s visual arts work has included three group shows and a solo show in a café, as well as a five year social practice project of “art manicures.” Otherwise, her visual practices have been kept private until now. Nadia is a first generation daughter of Indian parents. She was born in Saskatoon, grew up in Ottawa, matured in Vancouver and is currently living in Montreal all of which she recognizes as the traditional territories of Indigenous peoples who are their rightful stewards. Find out more about Nadia.